Construction, Infrastructure, & Trees - Tree Solutions Inc.
We provide tree protection services for construction and remodeling projects. Our team is experienced in assessment of sites, soil conditions, and plan review. We provide written tree protection specifications, with supervision of construction near protection zones, root pruning as needed, and follow-up inspections are standard. 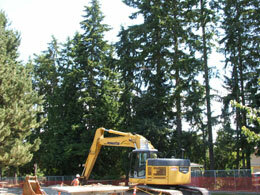 We can be on call to provide timely advice for handling unforeseen tree protection problems. We have expertise in development issues and can make recommendations during the planning process, including drafting of EIS documents or providing information for SEPA.